Inscriptions on wedding rings are nearly as old as the tradition itself and can help make these symbols of fidelity even more special. The blank inner surface of any ring offers a tempting canvas to the artisan and people have been inscribing rings as long as they've been forged. Inscriptions have been recorded in wedding rings for hundreds of years in Europe. They were especially popular in medieval and Renaissance Germany among both Christian and Jewish populations. This was such a heartwarming tradition that soon spread to wedding rings elsewhere in Europe and thence to American wedding rings as well. Engraved inscription will be a permanent part of your wedding rings, so it's best to choose one you can live with 'til Death do you part. Some inscriptions on wedding rings are as simple as the classic "XOXOXO" -- hugs and kisses -- while others go for something more elaborate (though not too elaborate, of course; wedding rings offer only so much inscription space). Religious inscriptions are always a good choice: consider the beauty of the wedding ring inscription "Bless, O Lord, This Ring," written in classic, flowing script. Then there's the inscription that seems tailor-made for wedding rings: "For Whither Thou Goest, I Will Follow." There's nothing wrong with plain language for your wedding rings -- after all, good communication is key to any successful relationship. Nothing says it like it is like a simple "Forever," or "Forevermore." If you're not into brevity, there are other great inscriptions a bit more wordy but perfect for wedding rings: "One Life, One Love," "My Heart is Yours," "Two Bodies, One Heart," or "With You Always." Brings a tear to your eye, doesn't it? Other straightforward inscriptions often seen in wedding rings are sentiments like "For You Alone," "Grow Old With Me," and even the pithy "Life is Good." Sometimes love is just too meaningful for words; if this is the case with you, why not have your wedding rings inscribed with your names and initials, and the date of the Big Day? Foreign-language inscriptions are also favorites for wedding rings. Not too surprisingly French, "the language of love," comprises most of these. Nothing says love quite like "A Vila Mon Coeur Gardi Li Mo" (Here is My Heart, Guard It Well). "Vous Et Nul Autre" (You and No Other) is also an excellent choice, as is the simple Latin inscription "Te Amo (I Love You)." On the other hand, some people elect to have something humorous inscribed inside their wedding bands: "Put It Back On!" and "No Guts, No Glory" are frequently cited and so is the Star Wars slogan "May the Force Be With Us." 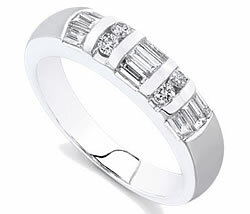 The inscriptions themselves tend not to be expensive, especially considering the cost of the wedding rings themselves. Whatever you decide to have inscribed inside your wedding rings, the limitations are only your imagination and the size of the ring's inner surface. Any of the inscriptions we've suggested are great, but don't let that limit your choices. You'll find plenty of great ideas on the Internet, in books, on TV -- everywhere you look.